Story: His House Caught Fire - Something New Everyday! "Don't be worried. I sold it yesterday and at a very good price ― three times. The offer was so good I could not wait for you. Forgive me." It is the same house....the same fire.... everything is the same...but now he is not concerned. And then the third son comes, and he says, "That man is a man of his word. I have just come from him. He said, 'It doesn't matter whether the house is burnt or not, it is mine. And I am going to pay the price that I have settled for. 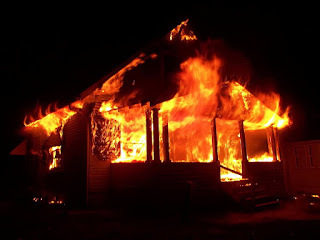 Neither you knew, nor I knew that the house would catch on fire.'" Just the feeling that "I am the owner! I am not the owner of the house!" The Moral : This simple methodology of watching the mind, That you have nothing to do with it. Everything starts with a Thought!